On this page, follow the life of the domain, on the vineyard and in the cellar. You can also read all our newsletters. After a difficult year during which the science of the winemaker was essential to express the best of our vinses facing challenging weather conditions, we had a few good weeks for the harvest. The volume is low but the quality is there. Our clients and friends will not be disappointed. Starting this winter, we are offering our Crémant de Bourgogne, bold and fresh. For the first time one of our wines has been ranked by the "Wine Spectator". Our Juliénas Domaine des Mouilles 2010 received a 84/100. The harvest has begun on September 14. Although yield is a bit below the standard, quality is very good, with perfectly ripe berries. Like last year, the winter has been long. In our Spring 2009 Newsletter, we predicted then a great vintage, which seems to be confirmed. After a long and harsh winter, with a lot of snowfalls, the vines have started to wake up around mid-April. Today, the stems are already 15-20 cm long (6 to 8 inches) after two very warm weeks. We are again under the rain, which does not prevent us from finishing plowing under the vines. The 2009 wines are now racked, and the “assemblages” finalized. We started bottling the first 2009 vintages. It is meeting or even surpassing our best expectations, with very ripe red fruit aromas, a nice maturity and mellowed tannins. The first professional tastings have begun and the comments are already very positive. 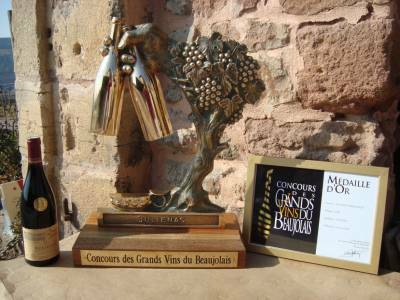 For instance, our Julienas 2009 “Chateau de la Bottière – Cuvée Traditionnelle” has received a silver medal at the Macon competition. We have also presented our wines to professionals at the Cannes Wine Export Convention, where they impressed the Americans as much as the Singapourians. Since Easter, we started selling the first 2009 Crus: Juliénas, Moulin-à-Vent et Saint Amour ; Morgon, Chénas and Fleurie will be available in a few weeks. On November 21-22, our traditional Open Doors were a great success! We even had to label bottles in a rush for our Beaujolais Vllage Nouveau and the just launched Beaujolais Nouveau rosé. The harvest has begun a bit ahead of our initial schedule, on August 22. The grapes are already ripe, sweet, very healthy, with a potential similar to the 2005 vintage. On the other hand, because the summer was warm and drier, the volume will be reduced. Our 40 "vendangeurs" are very busy working under a scorching sun, but in a very good mood, the pleasure of picking very healthy grapes that do not require sorting. We will place a few pictures on line as soon as possible. July 14, 2009 - Today is “Bastille Day”, the French National Holiday. We take the opportunity to give you the latest news of the Domaine. The vines are in superb condition with absolutely no trace of rot. The harvest will be a little smaller than average, but of very high quality. This good health of the vines helps us with our sustainable wine making philosophy. Recently, we had one or two thunderstorms, but no hail. The water can damage the soil: we feel the benefits of our decision to keep more grass in the vineyard, especially those with a steeper slope; nevertheless we need to raise the “charrois”, the narrow trenches that help eliminate water. We forecast the harvest at the end of August or early September, which is a good sign. The best vintages started often with a cold winter and a sunny spring like this year, with the harvest starting early. If you know candidates interested in harvesting with us, do not hesitate to give them our address. This is a hard work but very friendly, bringing all its conviviality to our Beaujolais traditions. Our traditional crus, 2008 vintage, are now bottled. Those cuvees show nice red berries aromas and tannins melted with the fruit. It is a soft vintage that can be drunk young without disappointing. Our special cuvees are still in oak barrels, slowly finishing their malolactic fermentation with the coming of the warmer days. Our first Saint-Amour is now available at the Domaine. You can enjoy it during your next visit. Our wines have again received numerous awards and references in the specialized press. This summer, we launch our new website, totally redesigned to speed up access to the information, to reflect better the personality of the domain, and to provide more detail on our wines. The winter was longer and harsher, with many occurrences of freezing temperatures, frost, and snow. It is often a sign of a good year: 2003, 2005 or 1999 were also marked by cold winters. The water reserves in the soil are now sufficient. A long winter kills damaging insects that hide in the vines. Therefore, there will be less need for treatment in the Spring. We continue to increase the acreage with grass and change the way we prune the vines from the "taille gobelet" to the "taille en cordon de royan", better suited for a vineyard enherbed. This gives us also a vine with deeper roots, and a better resistance to wetter or drier weather. On the Moulin-à-Vent and Morgon appellations, the grapes were very healthy. The 2008 Morgon 2008 is already considered as a great vintage, with aromas of red berries and spices. The last cuvees are finishing their malolactic fermentation in the barrels that sit in the centuries old cellar of the Chateau de la Bottière. 2008 will see our first Saint-Amour, the latest addition to the domain: it has just been tasted by an expert pannel who found it very promising. We did not want to sell it for Valentine Day 2009, like many do. Instead, we prefer a slower maturing of the wine and a bottling around Eastern. You will appreciate it for Valentine Day 2010 or keep it until Valentine Day 2015 or even later. We have just opened a bottle of our Julienas Vieilles Vignes 1999. The wine, was 10 years old and had lost none of its appeal. On the contrary, all the aromas were perfectly blended, very smoothly, for a memorable tasting. The 2008 harvest wines is now slowly developing into the Beaujolais Crus that we will bottle in a few months, except for a few "Beaujolais Village Nouveau" that we produce for our Portes Ouvertes. This year, this event was enhanced by the presence of other winemakers, like Claire Naudin, from the Domaine Naudin in Burgundy. This winter was mild. February, unseasonably warm, made us fear a precocious harvest like in 2003. Fortunately, March and April were cool, allowing us to plan on a regular harvest. Spring care was performed under a rather wet weather, which forced us to watch for the mildew, a rot dangerous for the grapes and the leaves. Starting with two weeks of very nice weather in June, then an almost continuous sunshine after July 10, the summer is there. The vines are beautiful because of the water they received in the spring. In the richest plots, we let grass grow between the rows of vines to regulate their growth. Therefore all the vines are showing already a very promising harvest. Our traditional vintages are bottled since June. 2007 reveals all its promises, very refined wines, red fruit aromas, the gamay to its fullest potential. This year, our Moulin-à-Vent, which is growing in a manganese rich soil, is especially seducing. Laurent introduced our wines on the US West Coast, in Los Angeles and Seattle. The American do not know very well the crus of Beaujolais but once they taste them, they fall in love. Our “special cuvee” received the most positive comments. Jon Rimmerman has written an article that made us very proud. May is also the month of the celebrations of St Julienas des Prés in the famous 6th arrondissement of Paris. 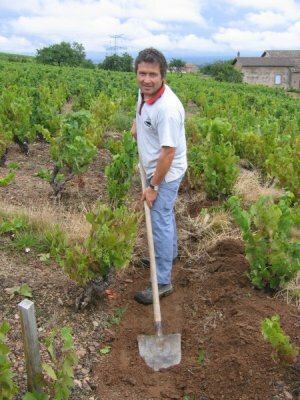 In 1993, Julienas wine makers planted 12 vines in the churchyard of the St Germain church. To watch over those vines, they created the brotherhood of “Saint Juliénas des Prés” attended by the wine lovers of the Latin Quarter and the artists of the city of light. Every year, 12 famous wine lovers become guardians of each vine. Laurent, the president of the Julienas Cru, was obviously there to animate this event. This summer, our Morgon 2007 “Les Versauds” receives an award by Cuisine et Vins de France; our Moulin-à-Vent is referenced in “Bourgogne Aujourd’hui”. Three school year friends invested in a small vineyard of St-Amour, at les Gagères. They have asked to tender those vines. So, with the 2008 vintage, a few hundred bottles of this romantic wine will be offered at the Domaine. In October and November, we plow the vineyard and remove the old vines. Just before Christmas, a cold snap prevented us to work in the vineyard. On the other hand, it gave us the opportunity to take some unusual pictures that you will find on our web site. Fall is the period during which we taste the new wines and begin to work on the selection of the individual wines that go into each of our cuvees. The 2007 vintage is very elegant, and already develops multiple aromas. The wine continues its ageing in our vats, our foudres (very large barrels) and our 180 oak barrels. November and December are the peak selling months with 70 % of our bottles sold during that period. We travel across France and Europe for wine fairs, deliveries and private tastings. As you can imagine, our Julienas Vieilles Vignes 2005 “Coup de Cœur Guide Hachette 2008” is selling very briskly. We still have a few bottles but hurry up if you want to place an order. November is also the time for our traditional open door. We close one year and start the next with friends, around traditional Beaujolais food and wines. We organize a contest with a mystery wine to identify: this year it was a Julienas Vieilles Vignes 2000. At the beginning of 2008 we launch a new prestigious wine: the Bourgogne Rouge Gamay noir, with 2006 as the launch vintage. This cuvee is produced with grapes some of our better vines, that express all their character from the granitic soils they grow on. This wine has aged 12 months in oak barrel and comes with an upscale, traditional labeling.